Blockchain technology is undeniably changing the face of the digital music industry. However, existing blockchain music services focus solely on improving established streaming and distribution structures, and fail to address fundamental problems of the current industry. Future music products developed with blockchain, unlike their predecessors, must utilize the technology to provide innovative functions that revolutionize the music industry at its core. Maestro is a comprehensive music platform that integrates investment, distribution, and profit realization. Maestro is a blockchain-based platform that is largely comprised of two parts: the crowdfunding service that handles the attraction, investment, allocation, and balancing of accounts for funding, and the streaming service that handles the distribution of music. The Maestro System is made up of two platforms, Ensemble and Symphony. These two platforms are connected to Maestro’s blockchain through smart contracts, with all music files encrypted and stored in distributed storage. We are currently focusing on developing service operations, and aim to eventually establish a decentralized platform through distributed storage powered by EOS.IO. 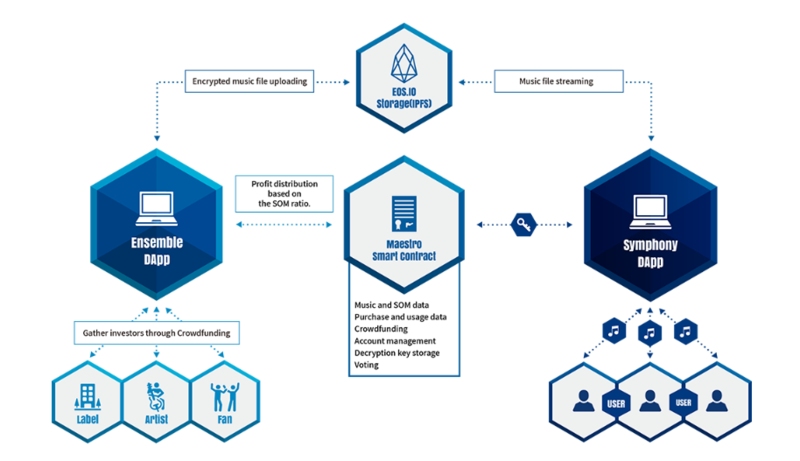 Maestro’s set of smart contracts, along with the contracts for listening and payment for usage of the streaming service, include rights distribution and profit allocation of songs through the funding system. It also holds the decryption key for the music stored in Maestro’s encrypted distributed storage. While using the service, consumers will use the Maestro token to receive a decryption key to stream their music. Symphony is the streaming client of Maestro. We at Maestro plan to develop the mobile version of the application after fully developing the web platform. Symphony transparently records streaming service usage as well as other relevant activities, such as user votes and public inquiries of Maestro’s blockchain. Ensemble is a crowdfunding decentralized application (DApp) that allows the artist to create projects and raise funds. Artists can personally distribute the rights to their work and designate the amount of funds they wish to receive. Ensemble actively aids artists in obtaining funding for their projects as well as securing their rights. The system also manages the balancing of accounts and allocation of revenue. In the early stages of service, Maestro will store music through a centralized server for maximum efficiency and fast service performance. In the mature system, all music uploaded to Maestro will be encrypted and stored in distributed storage. When uploading the files, music will be encoded and stored according to their sound quality and file format, such as Hz and Kbps. The Maestro Token (MAE) is the base currency of Maestro. This token is the payment method for the streaming service and will be listed on the exchange. All payment methods within the service will use Maestro Tokens. Investment profit will also be distributed in Maestro Tokens. Stake of Music (SOM) is the proof of rights to creative content given to investors in projects. SOM is initially held by the artist, who can choose to allocate it among investors at the crowdfunding stage. SOM holds the rights to profits generated by the creative work; all profits from the platform are equitably allocated based on the SOM ratios. SOM transactions are all recorded on the blockchain. Maestro Points (MSPs) are the influence used for upvotes and downvotes in the Symphony streaming service. MSPs are granted based on the number of Maestro Tokens (MAEs) held, streaming service usage, and SOMs obtained by participating in Ensemble funding.